Brazil was perhaps not a good theme for a participation-driven issue as that country is one of the few with a known collecting population not represented in the membership. However the co-incidence of the Santos Dumont anniversary, World Cup football, the emergence of Embraer as the most prolific airliner manufacturer after Boeing/Airbus, and, not least the many fine cards from that country, suggested that Brazil in 2006 was a good idea. We have articles on Santos Dumont – the man and the Airport and a survey of Brazil airline cards and their issuers. 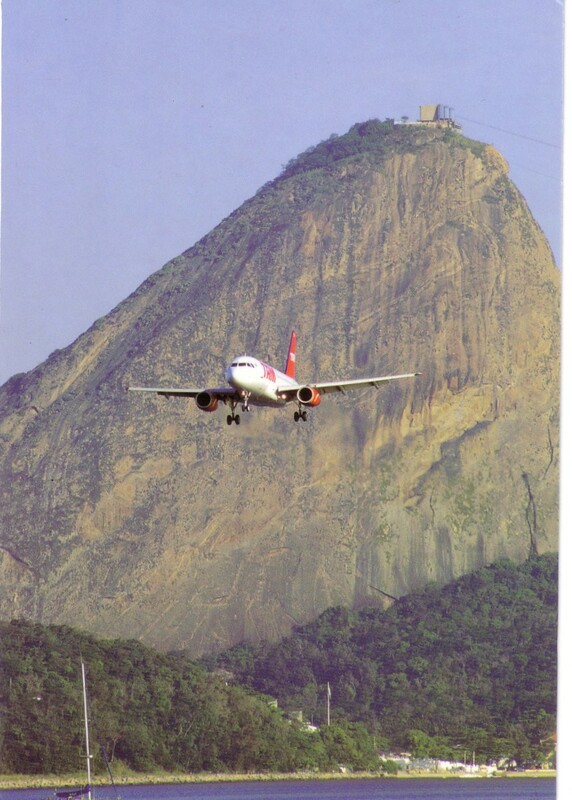 To set the scene is an unusual “scenic” view from “Postcard” one of the current crop of Czech publishers and shows an Airbus A320 of Brazil airline TAM on approach to Santos Dumont Airport, Rio. Bill Baird’s US pages are back to normal – although normal means you get Seasonal greetings as this copy went out with the December issue in North America. Bill’s contacts continue to keep him supplied with copies of the few airline issue cards still coming out.